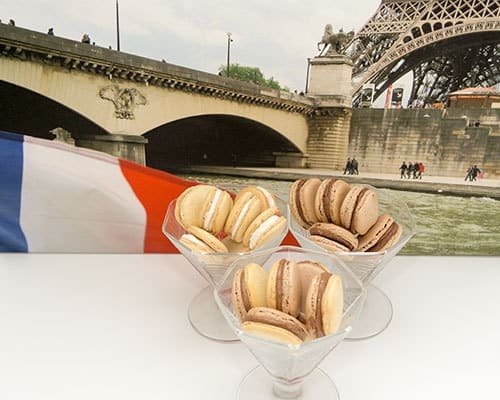 While we were in Paris, we tried macarons from Ladurée, Pierre Hermé, and of all places – McDonalds. 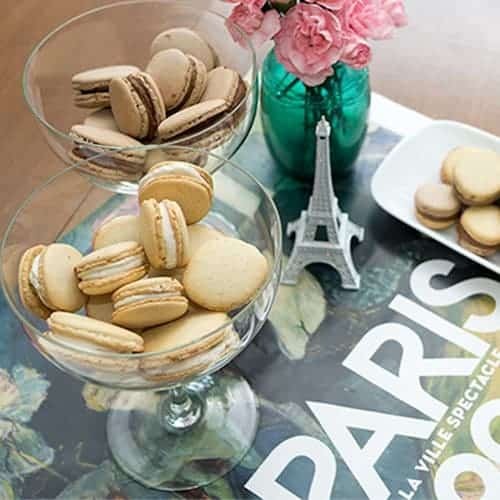 Susan brought some macarons back from Paris, which are long gone. Since then, she has been going through macaron withdrawal symptoms, so she decided to try her hand at making them. 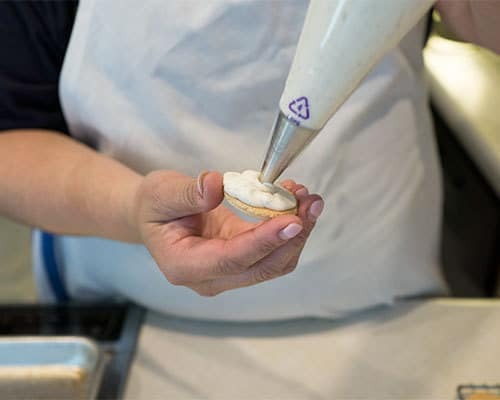 There are a lot of different recipes out there, and different meringue techniques that are incorporated into the macarons. Susan decided to start with the recipe from The Baker Chick’s blog. 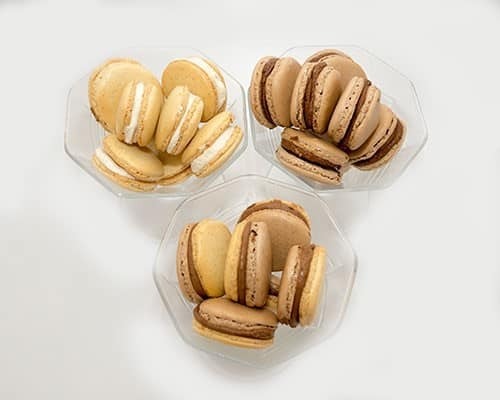 Part of the reason for using this recipe is that it’s based on the macaron class offered by Cook’n with Class Paris. This happens to be the school that Susan and I attended for several different sessions, but unfortunately we did not do the macaron class. She used the recipe from The Baker Chick’s blog as a starting point, because it’s a basic macaron recipe. 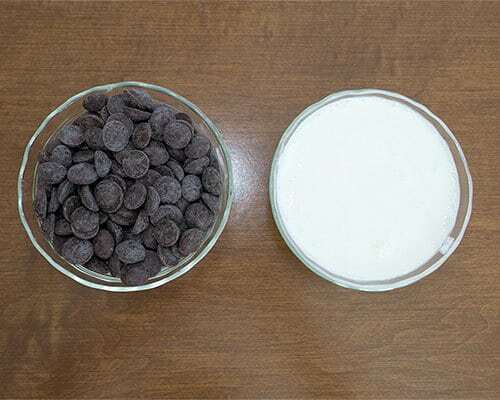 Since she wanted to make chocolate shells and vanilla shells, once all of the ingredients were weighed out, she divided the ingredients in half, adding cocoa powder to one half and vanilla paste to the other half. 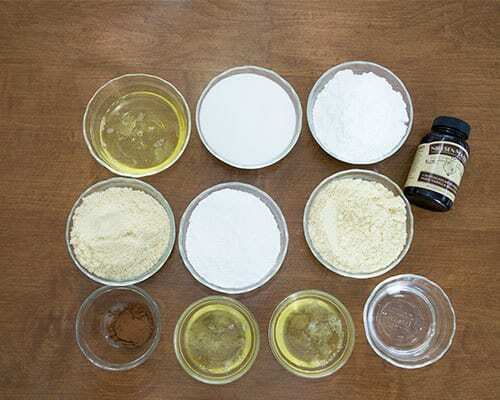 The ingredients included almond flour, confectioners’ sugar, egg whites, cocoa, vanilla paste, granulated sugar and water. As a first step, Susan weighed everything out. She ended up scaling the recipe because she didn’t have quite enough of the almond flour for the full recipe. 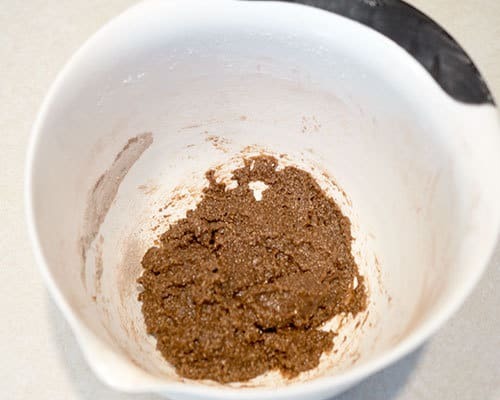 Because the almond flour was not as finely ground as was necessary, she pulsed it in the food processor, and sifted it several times. 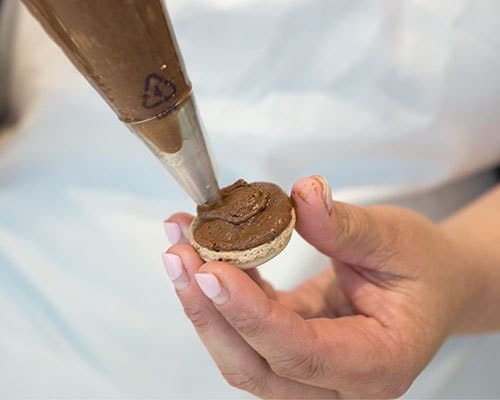 For the final sift, she added the almond flour, confectioners’ sugar and cocoa for the chocolate macarons, and almond flour and confectioners’ sugar for the vanilla ones. After thoroughly combining the dry ingredients for both kinds of shells, she added the half of the egg whites to each mixture. At this point, she added the vanilla paste to the mixture for the vanilla shells. 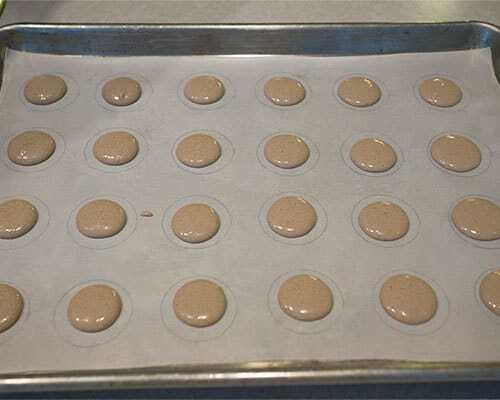 There are several different type of meringue that can be used in making macarons. Susan decided, since she had experience making it in the past, that she would make an Italian Meringue. It consists of a simple syrup, made of granulated sugar and water, incorporated into whipped egg whites. The sugar and water were heated over medium heat to 225° F. Then she began beating the egg whites to a soft peak stage while the syrup temperature climbed to 239° F. Once the syrup reached the appropriate temperature, I carefully poured it into the side of the bowl while Susan continued beating the egg whites to a glossy stiff peak. Because she was making two different types of shells, she gently folded in about a fourth to the chocolate batter, and a fourth to the vanilla batter. She gradually added the rest of the meringue to the two batters until they were smooth and the batter almost ribboned off the spoon. Meanwhile, I drew 2-inch circles on parchment paper to serve as a guide. I had wanted the circles to be 1¾-inches because of the size of the macarons we had in Paris, but didn’t have anything that was quite the right size. As it turned out, it really didn’t matter. Susan added the batter to a disposable piping bag fitted with #12 round tip, and piped small rounds with the bag perpendicular to the baking sheet. To ensure that the shells were as uniform as possible, and that they were not too large, she counted “1, 2, 3”, as was suggested in the Baker Chick’s blog. This worked like a charm. Counting to three also ensured that the piped shells were smaller than the circles that were drawn on the parchment. Because of the consistency of the batter, the shells spread past their piped size. Susan let the piped shells sit out for around 30 minutes, until a trace of a shell was formed. This helps keep their shape while baking. The shells went into a preheated 300°F oven for 12 minutes. 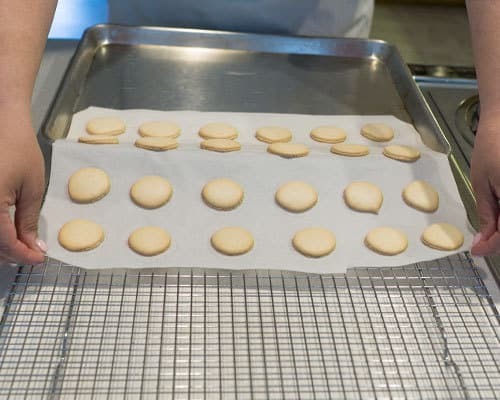 When they were removed from the oven, Susan let them cool slightly on wire racks, and then carefully transferred the shells on the parchment paper to wire racks to cool completely. When the shells were completely cooled, Susan removed them from the parchment paper, and set about matching them up size-wise. The plan was to fill the chocolate shells with chocolate ganache, the vanilla shells with vanilla butter cream, and the combination chocolate and vanilla shells with Nutella mousse. Next came the filling. 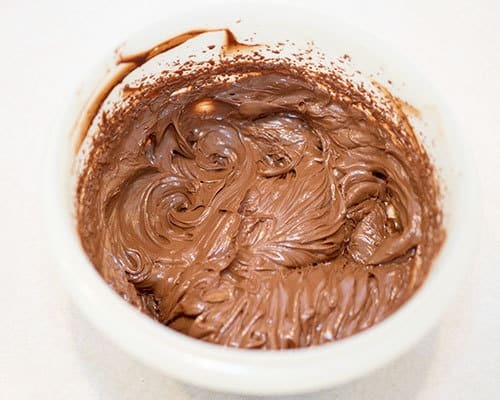 The ingredients for the chocolate ganache included bittersweet chocolate chips and whipping cream. Susan combined the whipping cream and the chocolate chips in a microwave safe bowl and microwaved it on high for 30 seconds. She stirred the mixture with a silicon spatula and microwaved on high for another 30 seconds. She stirred the mixture again and heated it on high in the microwave for a final 15 seconds. She then used a whisk to stir the mixture to ensure that all of the chocolate was melted and that the mixture was a smooth consistency. After the mixture was refrigerated for about 30 minutes, Susan beat it on high until it reached a piping consistency. The next filling was the Nutella mousse. 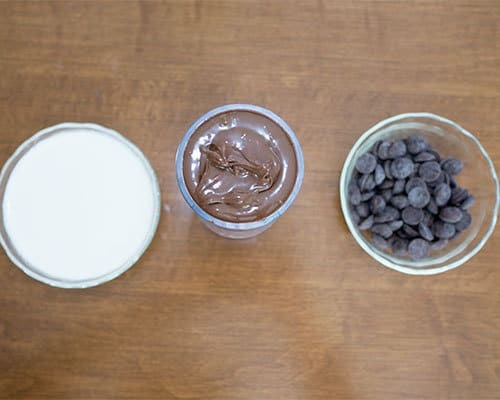 The ingredients included bittersweet chocolate chips, whipping cream and Nutella. The Nutella mousse was made in the same manner as the chocolate ganache. 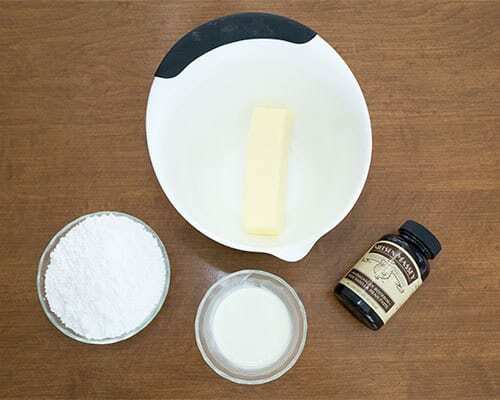 The ingredients for the vanilla butter cream included confectioners’ sugar, unsalted butter, whipping cream and vanilla paste. Susan made the vanilla butter cream by first beating the butter with a hand mixer until it was smooth. Then she added in the confectioners’ sugar a little bit at a time until it was all incorporated. She then added the cream a tablespoon at a time. Then finally added the vanilla paste and beat until the mixture was smooth and of piping consistency. Susan fitted a disposable piping bag with the #12 round tip (the same one that was used to pipe the shells), and added the chocolate ganache. She piped the chocolate ganache on the underside of one of the chocolate shells and topped it with another chocolate shell. 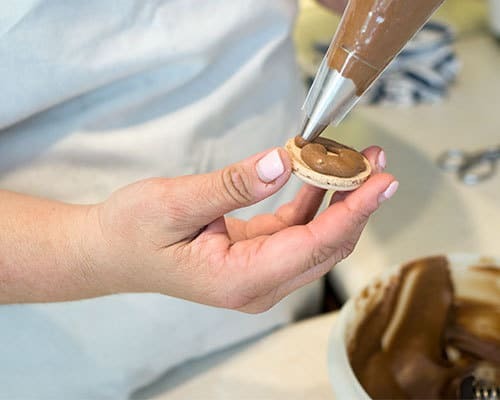 She piped the Nutella mousse on the underside of a vanilla shell, and topped it with a chocolate shell. Finally, she piped the vanilla butter cream on the underside of a vanilla shell, and topped it with another vanilla shell. All in all, she ended up with 24 chocolate macarons, 24 vanilla macarons, and 24 Nutella macarons. Were they as good as the ones in Paris? No – they were actually better! They were much more flavorful than the Paris macarons. Yum! 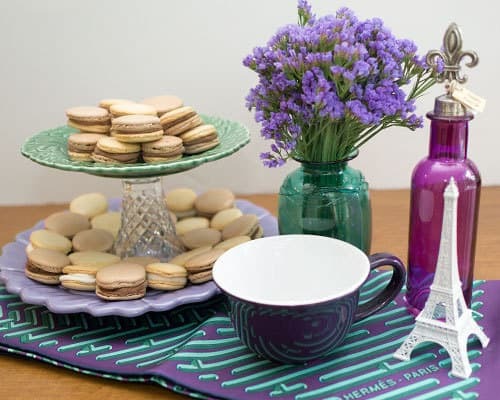 French macarons are all the rage these days. While they look complicated, they're really pretty easy to make. 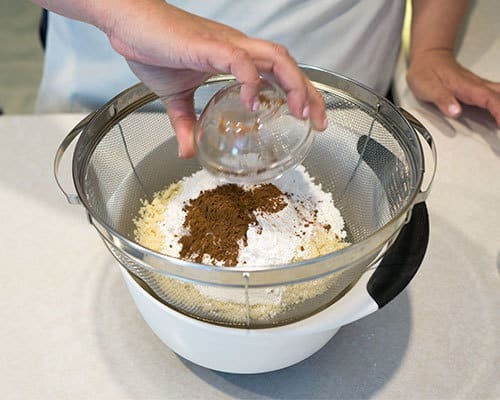 In a large bowl, whisk together the sifted almond meal and confectioners' sugar- breaking up any lumps or large bits. Make a well in the center of the bowl and pour in 88 grams of egg whites in. 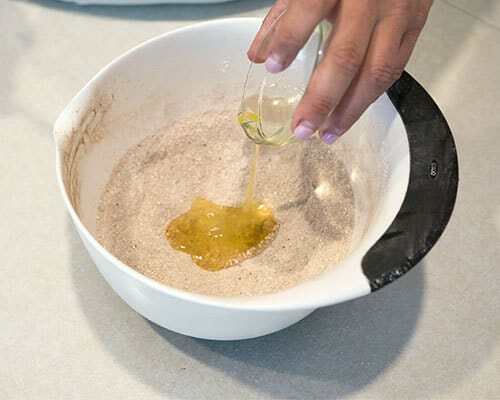 Fold them in gently until the mixture is well combined, thick and paste-like. Meanwhile, place the other 88 grams of egg whites into a large, clean bowl. Leave it be while you make the sugar syrup. In a small saucepan, combine the sugar and water and stir together until dissolved. Clip a candy thermometer to the side of the pan. When the syrup reaches 225° F, begin beating the egg whites on high with an electric mixer. You want them to be at soft peak stage, so as soon as they are, turn the speed to low until the syrup is ready. 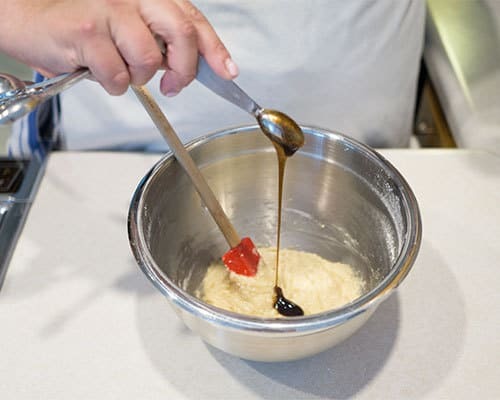 When the syrup hits 239° F, carefully pour it into the side of the bowl while the mixer is running. You don't want the syrup to run down the bowl, or it will cool, so aim to pour it right at the spot where the egg whites meet the side of the bowl. Beat on high for about a minute- and then reduce speed to medium low and continue beating until the bowl has cooled slightly, and glossy stiff peaks have formed. Add ½ of the meringue to the almond mixture, and gently fold it in until combined and smooth. 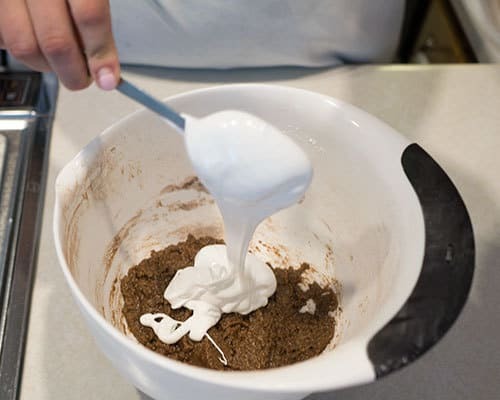 Gradually add the rest of the meringue until batter is smooth and it almost ribbons off the spoon. If you want to divide the batter and add gel coloring to any/part of it this is the time. After adding a bit of color, continue to fold it in until the batter is smooth and shiny and totally ribbons of the spoon. 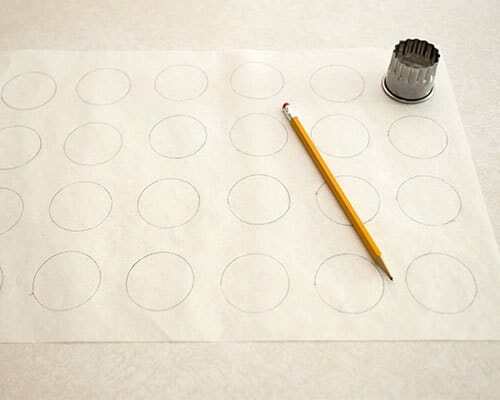 Prepare baking sheets with parchment paper with 2-inch circles drawn on underside of parchment paper. Fill piping bag with a #12 round tip and pipe shells onto parchment paper. Bake for about 12 minutes. To test if done, open the oven and wiggle the top of a shell back and forth. If it's super "wiggly" they need more time. Perfect macarons will be just a little wiggly, but overall firm. When done, remove parchment from the baking sheet sheet and let cool for 5 minutes on a wire rack. Gently peel parchment paper off and cool completely before filling with your filling of choice. 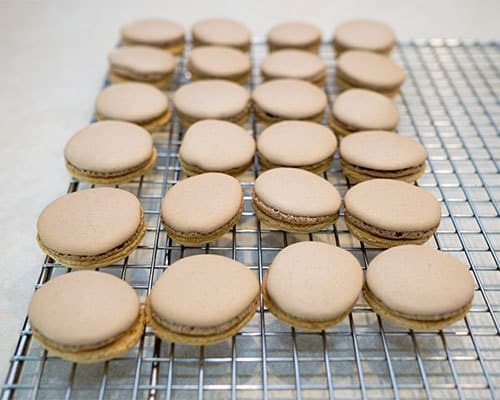 Macarons taste best when "ripened" in the refrigerator for 24-48 hours, but can last in the refrigerator air-tight for up to a week.